Apologies for the disruption in service. Little’un has been in hospital for a while and all my spare time is spent with him and my better half. Hopefully they will be home and normal service resumed later this week. I have started a visual book list. Looks quite nice, though the numbers of unfinished books worries me slightly. Will get round to writing little reviews at some point for each one. Chain Reading. It’s like a social booklist keeping thing. Kind of. You select the book you are reading, and have read, and will read. Recommend them to people. Maybe they will recommend some to you. Fairly interesting. “Prosecutors claim a Mac specialist on trial in connection with the killing of his wife did a Google search for the words: “neck snap break” and “hold” before she was killed. Robert Petrick, who is defending himself in Durham, NC, cross examined a computer forensics expert this week. The expert testified about digital footprints he said the state discovered on several hard drives in Petrick’s home,” reports TechWeb. I have a job interview on Friday, for a job in Scrutiny at Chester City Council. Am quite confident and am looking forward to the idea of getting back into Scrutiny. Browsing the Council’s website, it would appear that some of their councillors are blogging. Excellent! Great post from John Naughton. When will people learn to stop using MS file formats to distribute material? 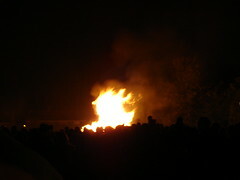 Had a jolly time at the bonfire and fireworks party last night. I guess a relevant link to push here would be Guy Fawkes’ blog – a great one for UK parliamentary rumour and gossip.